WWE Hall of Famer Bully Ray recently took to Twitter and voiced his displeasure over WWE's treatment of EC3. 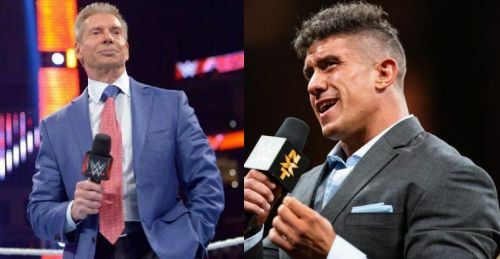 Ray stated that WWE should have left EC3 to grow in NXT until the right time came along. EC3 was one of several NXT Superstars who was called up to the main roster earlier this year. He debuted on Alexa Bliss' talk show, "Moment of Bliss", and has been turned into an afterthought since then. The former TNA Superstar lost his first main roster match to Dean Ambrose. He went on to compete in the Andre The Giant Memorial Battle Royal at WrestleMania 35, in a losing effort. EC3 was one of the most popular Superstars on the NXT brand and showed tons of promise. The WWE Universe was waiting with bated breath for his arrival on the main roster. He had the right look and was comfortable on the mic: the two significant factors that are essential for a wrestler to make it big on the main roster. WWE had other plans though, as EC3 is getting ruined on the red brand ever since he was called up. Whats the point of bringing up EC3 only to destroy him from day 1 on main roster?? Bully Ray doesn't seem too thrilled with how WWE is treating a promising athlete in EC3. He went on to vent out on Twitter, saying that EC3's credibility is being destroyed on the Raw brand ever since his debut, adding that there was no point on bringing him up. EC3 boasts an incredible physique and can certainly work a mic. His booking so far has been nothing but head-scratching. Hopefully, he gets something to do post the Superstar Shake-up, instead of being relegated to the mid-card with no end in sight. What are your thoughts on WWE's booking of EC3? WWE Rumours: Hall of Famer backstage on RAW to set up WrestleMania match? WWE Rumors: Did WWE just accidentally reveal future WWE Hall of Famer?